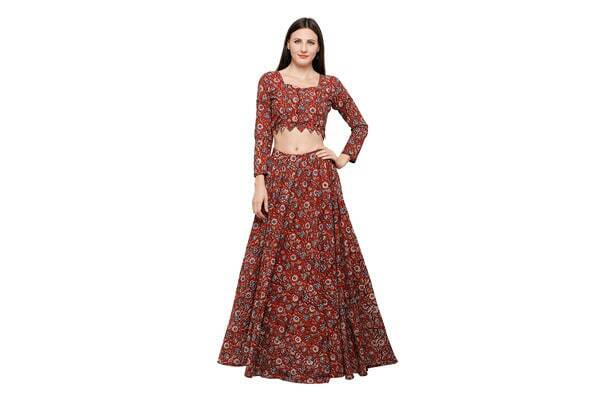 The Inddus Red Block Print Lehenga Set is among the best lehenga designs you can find anywhere; its blouse steals the show with a statement zig-zag hemline, and the floral red/blue print oozes femininity and spring all at once. 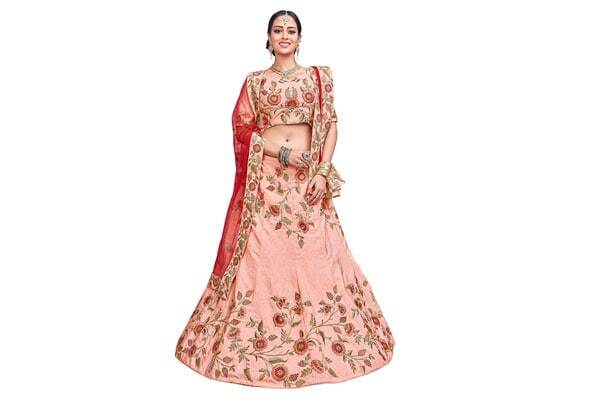 If understated luxury is your vibe, then this is the lehenga to buy. At the price, discounted or not, we think it's a steal. 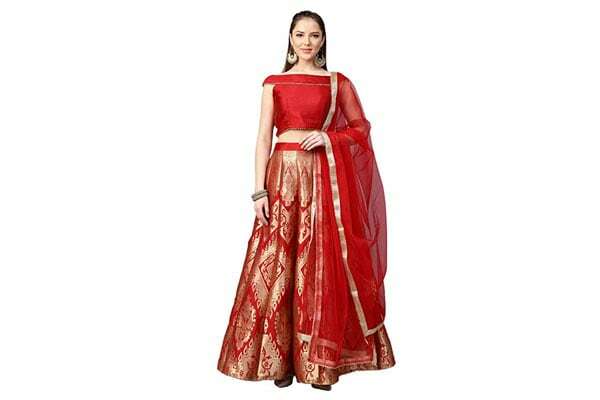 The Manvaa Women's Silk Embroidered Lehenga Choli is a silven piece with gold/red detail all over. Crafted out of silk, the set includes a lehenga, a blouse and a dupatta, that come together beautifully to create a truly regal ensemble. Pair this with a statement necklace and chunky earrings. 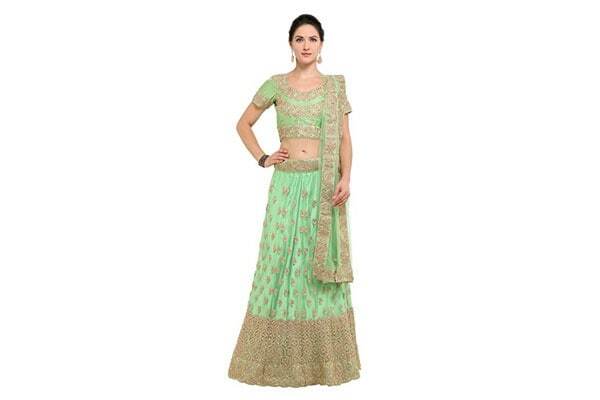 The Inddus Women's Blended Fabric Zari Embroidered Semi-Stitched Lehenga Choli features zari embroidery on a combination of net and a fresh, pastel green canvas. It's the perfect piece to wear if you want to look a goddess of the earth itself. Pair it with gold statement jewellery to complete your look. 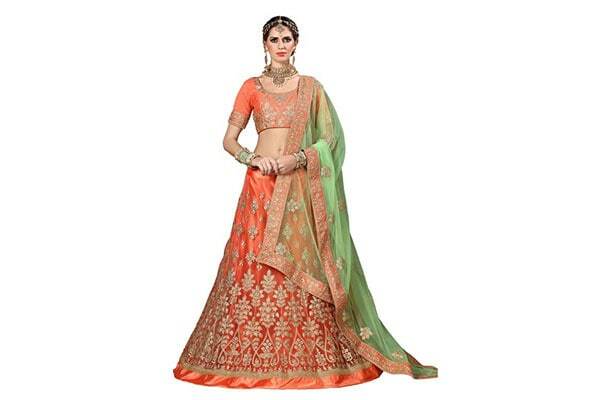 Moving away from spring-y, earthy palettes is this Aasvaa Light Orange Color Net Weaving Semi-Stitched Lehenga Choli, among the best lehenga designs in India. While the dupatta retains a hint of spring, the orange/gold lehenga and choli are striking, bold pieces that will blind with their radiance no matter what time of the day. Yellow's an unusual colour, so if you want a unique wedding ensemble, go for this yellow/gold lehenga, choli & dupatta set, featuring the best lehenga designs in India. The flare of the lehenga comes alive with red & gold highlights that trace flowerse above the hemline. A nice break from default spring palettes. 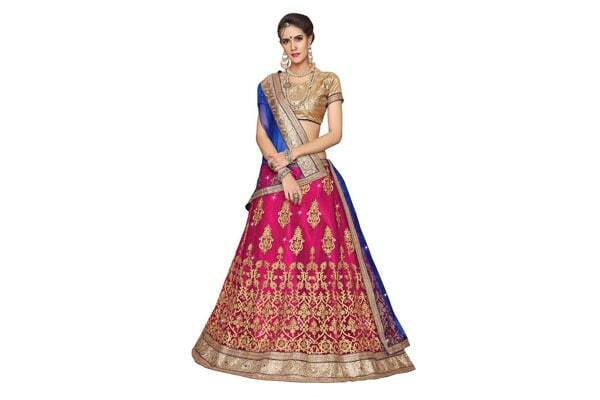 If you think pastels are overdone and want to go for an all-out colourful set, get this MANVAA Net Lehenga Choli set that includes a lehenga (red/gold), a choli (gold) and a dupatta (blue/gold). Then dazzle in a combination of the world's glitziest colours. Pair this with gold statement pieces. Thought we forgot the moody lot of the best lehenga designs in India? Nope, check out this Manvaa Bangalori Silk Women'S Embroidered piece. 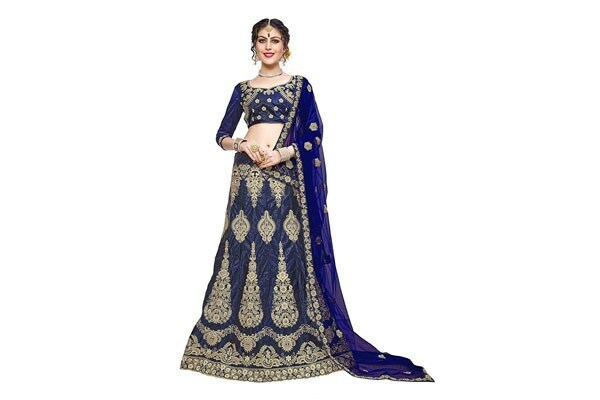 This set of lehenga, choli and dupatta is perfect if you prefer donning darker colours. Plus, it'll stand out in the sea of pastel spring pieces. Accessorize with gold. If you shy from heavy pieces, here's a contemporary take on the lehenga that we're drooling over -- the Inddus Women's Chanderi Cotton Blend Semi-Stitched Crop Top with Lehenga. 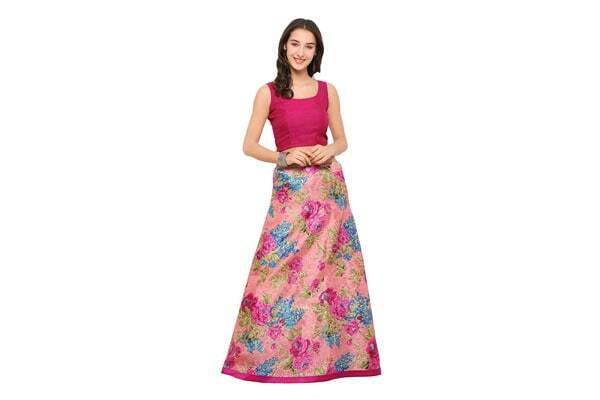 The set includes a crop top + a flower-spangled pink lehenga with a just-right flare. To dress up, pair this set with a matching dupatta. Here's a semi-stitched lehenga crafted out of Bangalori silk for women who like darker colours. Sequinned & embroidered with dori and zari, the set includes a lehenga, choli & dupatta. All under a thousand bucks, so if you're on a tight budget, this might be the best option for you. 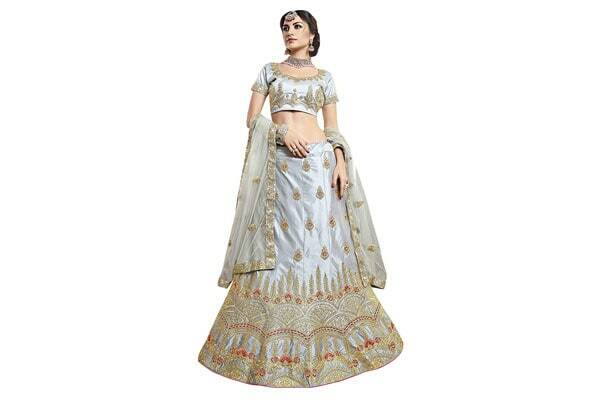 This Indian lehenga choli set, featuring sequins and embroidery, is made of Bangalori silk and includes a silvery-grey lehenga, choli and dupatta. It rings up really cheap at around 600, so while you may have to compromise on quality, all the saving will more than make up for it. Don't forget to accessorize with silver jewelry. 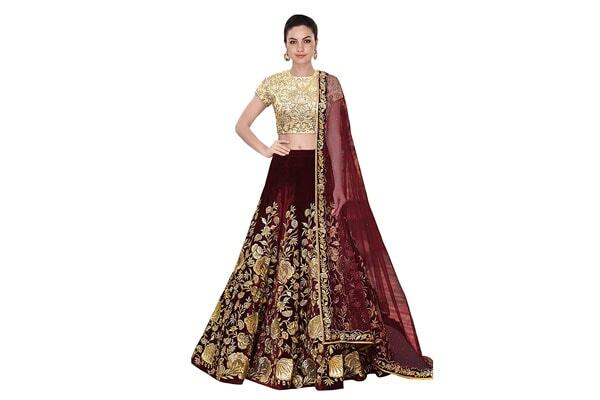 Among the best lehenga designs in India in the super-affordable range, this Taffeta Silk Lehenga Choli set that includes an unstitched blouse, a lehenga and a dupatta. The regal print features contrasting wine red & gold -- we love the golden flowers on the lehenga's flare. Pair this with gold/golden jewellery. 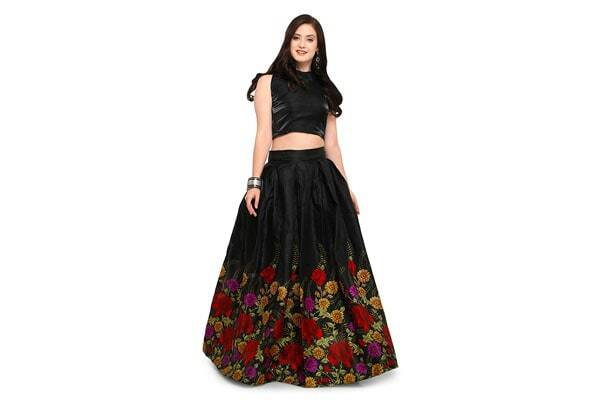 The EyesOnMe Women's Satin Lehenga Choli set includes a patterned floral lehenga + semi-stitched choli without the dupatta (we think you can go without it.) Get the black set to look sultry, and white to make an eye-catching statement. Pair it with ethnic footwear/heels and matching earrings. 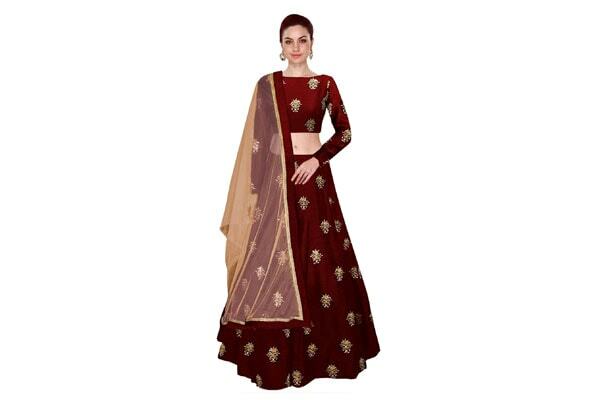 The Shree Impex Women's Embroidered Taffeta Silk Semi-Stitched Lehanga Choli set includes a taffeta silk lehenga and choli with a net dupatta. Its royal maroon base features gold block print all over. It rings up at around six-fifty -- that's a tempting deal, we think. Tweet to us @HotDeals360 to let us know your reviews of the best lehenga designs in India!